I've been working on a game I'm calling Planet Wars, a space shooter-like game, still very much a work in progress. Hey I am very interested in checking out your game, especially since I see that it uses Chingu. Could not find gem 'gameoverseer (>= 0) x86-mingw32' in the gems available on this machine. Is there perhaps a way for me to manually install the gem, working from the github source? Timers (http://rubygems.org/gems/timers) is a published gem, so doesn't make sense that it can't be found. I'd strongly suggest you publish the game using git links in your gemfile, so bundler can automatically find your gems from source, if you aren't going to publish the gems at rubygems.org. I've disabled the network code for the time being (as it isn't used currently). Thanks for the suggestion of using bundler to install GameOverseer, Spooner. I haven't pushed GameOverseer to RubyGems because it's not yet functional. Hey I tried again and it worked no problem. I just used 'git pull origin' and then 'bundle update' and then 'ruby planet-wars.rb'. The game looks really fantastic. The Welcome Screen / Credits / Settings are great. The in-game graphics looks really clean, and the mini-map is very cool. The game did lag a little bit for me, probably because I have an older computer (I assume), and possibly also because there is a fair amount of offscreen graphics (I would conjecture). Nicely done. I will be examining your code and educating myself on how it works. It probably wouldn't hurt to add a readme explaining game play and future development ideas. Thanks for the compliments ml, glad it's working for you. Does the lag happen when the enemy ships are firing at you, when using boost, or haphazardly? If it's while their firing at you it could be some logic related to deciding if they should be firing. if it's while using boost, it could be the ship is running out of, and gaining fuel at so same time making the ship seem to stutter due to speed constantly changing. if it's haphazardly and the music momentary cuts out it could just be Ruby's garbage collector. I did add a (quickly done) readme. I hashed out the background and the ship's particles, and it's still there. I set it so that there are 0 enemies and 0 portals in easy mode, and it's still there. That's all I've tried so far. The game is running at between 20 to 40 fps. The lag happens continuously about once every half-second or so, such that the planets appear to rotate like the second hand of a watch. I'll look into it a little deeper sometime soon. Overall I really like the game setup, and all the features you've included, especially building bases and collecting resources. Once you've landed on a planet and built your base, I find pressing enter again to be more convenient than esc for returning to flying around mode. This is a really good project and for my part it gets two thumbs up. Firstly, I apologize for not getting back to you sooner. I'm glad the source is helpful for you. Unfortunately, I have not been able to find the source of any slow downs. Thanks for the suggestion of changing the ESC to Enter to exit planet view. I haven't run the game, but on a quick glance at the code, I see a standard, but non-obvious slow-down effect. You are using Chingu::Text objects for the GUI, which means they are being changed continually (score, etc). Because of the implementation of that object, which renders the text into an image every time it is changed, this means that large numbers of images are created. Generally, this is OK, but you are also using TexPlay, which affects how new images are created (sometimes vastly slowing down that process, which is fine for static images, but not in this case where you are creating a large number of images). So, please try using good old fashioned Gosu::Font#draw for dynamic text - Chingu::Text objects should only be used for static text. I've have had issues with Chingu::Text with the Credits GameState (took over a second to load https://github.com/cyberarm/planet-wars/blob/master/lib/game/state/credits.rb), that is why I replaced it with this https://github.com/cyberarm/planet-wars/blob/master/lib/objects/text.rb. So, unless Chingu uses its own Text class when you use Gosu::Font[@font, @size], it should not be using Chingu::Text. I'm inclined to believe that it's an issue with the health bar image generation, when I was play testing on the household computers, the FPS was really bad unless your health was red, though, that was over a month ago. No, looks like you've already seen the issue with Chingu::Text not working well with TexPlay. Gosu::Font[font, size] is implemented by Chingu (I added that, so you can blame me if it fails), but all it does is cache the Gosu Font for you, so you don't re-create them if you ask for the same one again. I've released Planet Wars, 0.1.0. If you're on Windows there is a pre-built archive available here. Please report any issues you experience. Feel free to make suggestions about how it can be better. Hopefully fixed waves getting stuck. Added Waves, fixes #20, many small changes. Moved menus to subdirectory 'menus', moved GameInfo::Config out of version.rb, fixed music not playing when starting a second game, added menus for #20, started clearing out game_info.rb, code cleanup. Fixed #32 via lazy hack, changed game over time text. Changed enemy ship fixes #28, broke music manager #32, many small changes. Added AssetPack GUI, fixes #22. Added Configuration manager, sfx can now be disabled, bumped version to BETA. Added Asteroid, closes #21, Changed the way Ship moves, closes #25, Added HazardManager. Removed Enemy use of real time, made enemies share target. Made uninhabitable planets habitable, closes #23. Destroy unused object, hopefully fix slow down. Remove Bullets use of time, prevents bullet from dying to soon. Added proper notifications, reenabled Hobby of night font for menus. Cleaned up Game game state a little, added Confirm to prevent accidentally quitting game, moved Background to its own file. Added CC0 sound effects, changed ESC to Enter to leave planet view, moved all files into lib/planet-wars. It's quite something, but VERY laggy. I have no idea why, it shows 30-50 fps, but feels like it's 10. It might feel laggy because the planets would be jittering. I lazily built the game to play at 60 fps, so anything below about 45 fps will unfortunately feel off. How are you running it, via the Windows build, or from source? I used the Windows build, couldn't run it from source because of some ashton errors. From just looking at the video it seems like you're problem is with the turn rate of the ship. It seems to have a slight acceleration to it, and the entire rate of turning seems a bit slow (in terms of angle measure per unit time). But I couldn't say if that's actually bad in the context of the game, as I haven't played it yet. It's certainly something that could make a game feel sluggish, though. Well yeah, I noticed now it doesn't look so bad on the video. But the actual game just feels... off. The bullets appear to be moving only with minimal lag. The pacing of the game seems to be normal, at least what the video shows. Please report any issues you experience here. Made Particles first class, injected rb_set_image and rb_get_image into Ashton::ParticleEmitter inorder to use images with emitters. Excluding Scal asset pack while its in development, made asteroids able to have more then one image. Moved planets images around, removed hard coding of planet names. Moved enemies sprites to its own directory, fixed error in asset manager. make default asset pack a variable, did some DRYing up of asset preloading. Made help text more consistent. Hi, glad to see that you are still moving forward on this project. I look forward to trying it out with the updates. I will let you know how it goes. I hope you enjoy the updates. 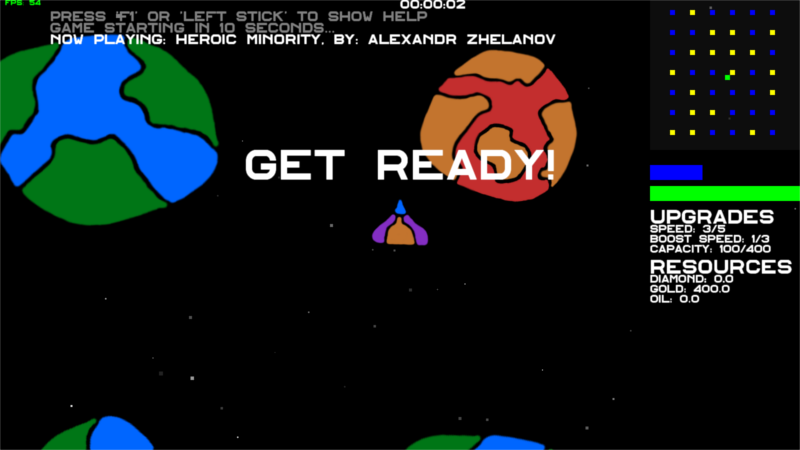 Updated menus, removed colors from credits, made base set its x and y position in prep for #36. My Linux OS was broken, so I've been away from Gosu for a while. I finally got Gosu working again (on a different computer), and I tried out the Planet Wars updates. It's looking good. I especially like the mini-map. The game is insanely hard. I managed to survive for five minutes though, as well as setting up bases on all the planets, but killing the aliens is nearly impossible. If you can ever figure out how to enable multi-player over the internet you will be a champion. Best wishes. I am presently working on releasing 0.1.4, a largely minor update with mainly theme related changes. The most notable change is that the game is no longer frame locked, meaning it should be fully playable at around 24fps. Skipped releasing 0.1.5 which added sfx to the menus and mouse hover cancelling; Can now use arrow keys to navigate menus with the mouse over top a button. Please report any issues you experience here or on Github.